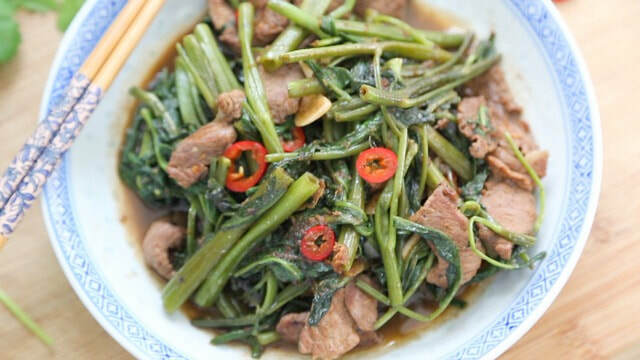 ﻿Sliced lamb stir-fried with a Taiwanese BBQ sauce is an amazing dish! 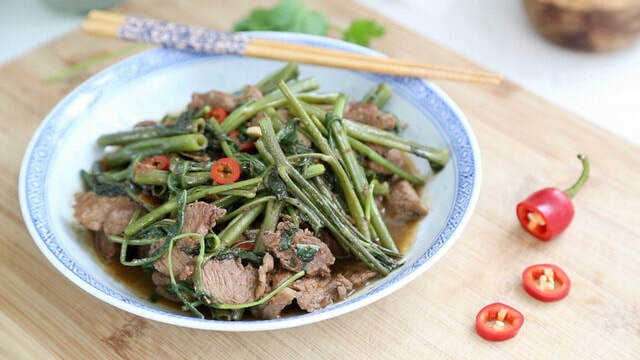 The Taiwanese BBQ sauce lends a savory and complex flavor (think shallots, garlic, and soy), while the water spinach (ong choy) gives this dish a bit of an addictive crunch. 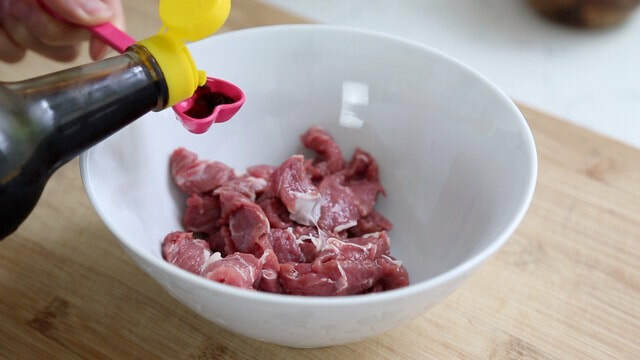 While it may look complex to make, it's actually only a handful of ingredients with a short lamb marinating time of only 20 minutes! It's definitely easy to make for a weeknight family style meal served with plenty of hot rice and other side dishes to complement. 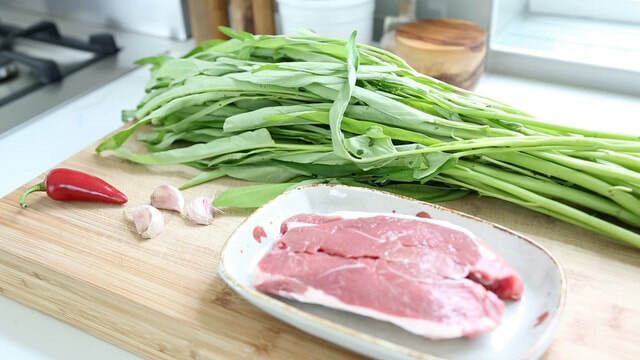 Tip: Look for fresh water spinach at your local Asian supermarket. It's oftentimes labeled as Ong Choy or 空心菜 (Kōngxīncài). Ready in Total Time: 35 min. Cook/Prep Time = 15 min. Marinating Time = 20 min. 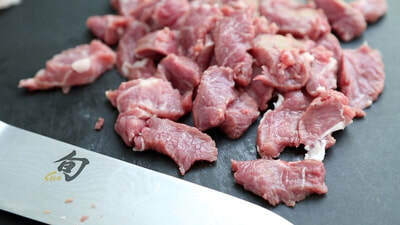 Slice the lamb into thin pieces against the grain. Marinate the lamb in the rice wine, soy sauce, and cane sugar for at least 20 minutes. 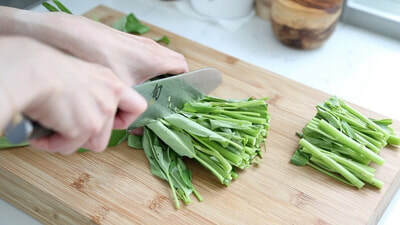 Cut the water spinach into 3 inch pieces and wash thoroughly. Slice the garlic and red chilies. Prepare the chicken broth mixture. Start with a pre-heated wok on high heat, add a bit of oil and the lamb. Stir-fry until about 65% done and remove from the wok. In the same wok, add additional oil and garlic. 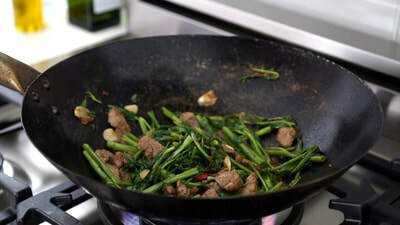 Stir-fry with the water spinach and chicken broth until the vegetables are slightly wilted. Add the BBQ sauce and stir-fry to dissolve and mix with the vegetables. Finally combine the lamb and the red chilies and stir-fry until done. Best served hot with a bowl of white rice.